CiloGear 45L Hauly: Happy Cragging! 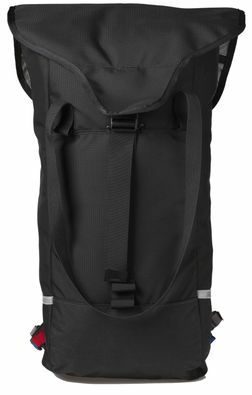 The 45L Hauly looks pretty simple. It's a big funnel bag made from burly Ballistics Nylon. It's strong and abrasion resistant. It's at home at the crag, will survive baggage handlers and has no problems if you have to haul it every once in a while. As with the other CiloGear Hauly Bags, you can stash the shoulder straps for transit. On this pack, the lid is also removable for nice cragging days. To make it easy to see inside, the side panels are a special 600d Cordura that's white on the inside. Of course, as with all CiloGear packs, the Hauly is deceptively simple. With the burly X-Pack bottom panel and the radical wedge shape, the 45L Hauly is simple to load at the crag and carries wonderfully. For hauling or if you check it in as luggage, the shoulder straps hide behind the protector pad. Additionally, the hipbelt can be used with or without the pods, allowing for anything from maximum comfort to minimum hassle for easy cragging. We built this pack to carry a big load. It is just as functional a load carrier as the award winning WorkSacks -- just built for abuse. The pack comes with a full framesheet and a removable pad, but also has a layer of foam sewn into the back to protect the shoulder straps if you check the pack as luggage or haul it.